For use as positive and negative controls in DNA methylation studies for any species. 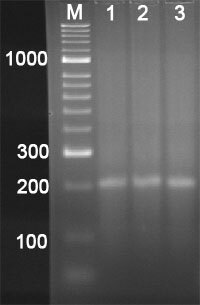 Each DNA standard (500 ng) was run on a 2.5% agarose gel. All three DNA standards are 200 bp and either unmodified (cytosine, Lane 1), methylated (5-mC, Lane 2) or hydroxymethylated (5-hmC, Lane 3). The DNA Methylation/Hydroxymethylation Standard Set is designed to be used as positive controls in DNA methylation experiments and various applications including MS/hMS-PCR and quantification of cytosine modifications in any species. It can also be used as substrates for studies involving 5-methylcytosine (5mC) and 5-hydroxymethylcytosine (5hmC) interacting proteins. Includes three DNA standards: unmodified DNA containing only cytosines as a negative control, methylated DNA containing only 5-methylcytosines (5-mC), and hydroxymethylated DNA containing only 5-hydroxymethylcytosines (5-hmC). Each standard is a 200 base pair fragment that was generated by PCR using the Methylamp™ MS-qPCR Fast Kit (Cat. #P-1028) and contains 57 cytosine residues on the forward strand, of which 19 are at CpG sites. Each DNA standard is confirmed by electrophoresis on an agarose gel. The included PCR primers contain both forward and reverse strand primers to amplify a 127 base pair PCR product of the DNA standard. These PCR primers can be used for either endpoint or real time PCR. Fig. 1. Each DNA standard (500 ng) was run on a 2.5% agarose gel. All three DNA standards are 200 bp and either unmodified (cytosine, Lane 1), methylated (5-mC, Lane 2) or hydroxymethylated (5-hmC, Lane 3).